CPU : Intel Core I9 8950HK. GPU : tùy chỉnh GTX 1080 hoặc RTX 2070 hoặc RTX 2080. Màn hình 17.3 inch 500-nit 4K UHD HDR400 IPS. Giá bán từ 1600 usd đến 2500 usd phụ thuộc cấu hình tùy chọn. Wanna join the discussion?! Login to your Vina Biz forum accountor Register a new forum account. Ngoài sản phẩm trên sản phẩm lai giữa laptop và máy tính bảng cũng đang được chờ đón là dòng Surface Book 3 của Microsoft cấu hình được đánh giá là có thể xử lí các tác vụ 3D mạnh như các dòng laptop mạnh của năm 2018 hoặc trước đó. Acer’s new semi-thin and light Predator Triton 500 arrives in February with a starting price at $1,799. It’s based on Nvidia’s RTX 20 series up to the RTX 2080 Max-Q graphics chip, enabling Acer to deliver an all-metal chassis just 0.70 inches thin and weighing 4.6 pounds. Bezels surrounding the 15.6-inch screen measure 0.25 inches thin. Other goodies under the hood include eighth-generation Intel Core i7 processors, up to 32GB of system memory at 2,666MHz, up to a pair of NVMe PCIe SSDs in RAID 0 at 512GB each, and a 1,920 x 1,080 resolution at 144Hz. The screen has a three-millisecond response time and Nvidia’s G-Sync technology for fluid, tear-free visuals. Unlike the Triton 500, you can configure the Triton 900 with a full-blown RTX 2080 graphics chip, though it makes the laptop thicker, at 0.94 inches, and features heftier starting price at $3,999. However, you’re not getting just another refreshed gaming laptop. There’s good reason to pay close attention to this specific model when it arrives in March. As shown in the image, the Triton 900 is technically a 2-in-1 device thanks to the Ezel Aero Hinges mounted on each side of the 17.3-inch screen. These hinges let gamers pull the screen forward over the keyboard and trackpad, flip it over for a hefty stand mode, or lay it flat on the keyboard for a super-thick gaming tablet. Other ingredients include up to a six-core Intel Core i7 processor, up to 32GB of system memory, support for Xbox controllers, G-Sync, and more. Alienware went back to the drawing board to create its first laptop redesign since 2014. Called Alienware Legend, this visual and structural overhaul will debut with the Area-51m on Jan. 29 at a starting price of $2,549. 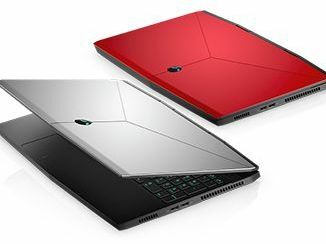 According to Dell, retooling the overall design enabled a laptop with 32 percent less volume than the previous Alienware model, though the Area-51m measures up to 1.7 inches thick at its peak height and weighs a maximum 8.54 pounds. This refresh introduces two new optional finishes, lunar light and dark side of the moon. Outside the makeover, the new Area-51m packs up to a ninth-generation Intel Core i9-9900K eight-core processor, up to an RTX 2080 graphics chip, up to 64GB of system memory (4x 16GB) at 2,400MHz, two NVMe PCIe SSDs and a hybrid hard drive, and a 17.3-inch IPS display with a Full HD resolution at 144Hz, Nvidia G-Sync, and Tobii eye-tracking. Unlike the Area-51m, Alienware targets the thin and light gaming market with its m15 and m17 laptops. Both have four GPU options, ranging from the GTX 1050 Ti to the RTX 2080 with Max-Q. There are a few differences between the two outside their obvious screen sizes, like a Full HD 144Hz display option on the m15 and a QHD 120Hz display option on the m17. Customers can configure these laptops with three processor options, up to Intel’s eighth-generation Core i9-8950HK six-core chip. You’ll also get up to 32GB of system memory at 2,666MHz (2x 16GB), dual storage options, 2.5Gbps ethernet networking, and more. The m17 measures 0.91 inches thick at its highest peak, with an average weight of 5.79 pounds. The m15 is slightly lighter and thinner at 4.78 pounds and 0.83 inches. The m17 arrives January 29 starting at $1,649. The m15 is available now starting at $1,379, though models with the RTX 20 Series start at $1,579 when they ship on January 29. Asus refreshed the ROG G703 laptop with Nvidia’s RTX 2080 graphics chip. Expected to arrive this quarter for an unknown starting price, the G703 relies on a 17.3-inch “IPS-type” display with a 144Hz refresh rate, a three-millisecond response time, support for 100 percent of the sRGB color space, and Nvidia G-Sync. The laptop’s overall size is around two inches at its thickest point and just over ten pounds. As for other ingredients, you’ll see configurations with up to 64GB of system memory at 2,666MHz, Thunderbolt 3 connectivity, and Intel’s Core i7-8750H processor. For audio, the ROG G703 provides a pair of two-watt treble speakers and a pair of 4.5-watt bass speakers with Smart AMP technology. Technically the ROG Mothership is a hefty detachable gaming PC packing all the hardware in a Microsoft Surface-style 17.3-inch “tablet.” Unlike an all-in-one PC, it’s meant for portability, and includes a built-in kickstand and a detachable per-key RGB backlit chiclet keyboard. The screen itself relies on an IPS-level Full HD panel with a 144Hz refresh rate, a three-millisecond response, and Nvidia’s G-Sync technology for smooth tear-free framerates. Under the hood it has Intel’s overclocked Core i9-8950HK six-core processor, Nvidia’s RTX 2080 graphics chip, up to 64GB of system memory at 2,666MHz, and three M.2 NVMe PCIe SSDs in RAID 0 at 512GB each. On the connectivity front, it provides one Thunderbolt 3 port, three USB ports at 10Gbps, HDMI output, one USB Type-C port at 10Gbps, and more. The “tablet” portion weighs around 10.4 pounds. If you’re looking for a “slim” gaming solution from Asus, the refreshed Zephyrus S GX701 is your ticket. Measuring around 0.73 inches thick, configurations include up to an RTX 2080 with Max-Q GPU paired with Intel’s Core i7-8750H processor. These chips are backed by up to 16GB of system memory at 2,666MHz, 8GB of Intel Optane memory, and two storage slots supporting up to 1TB each. With the GX701, Asus says it crammed a 17.3-inch screen into a 15.7-inch frame with 6.9mm bezels. This screen relies on an IPS-level panel with a Full HD resolution at 144Hz, a three-millisecond response time, support for 100 percent of the sRGB color space, and Nvidia’s G-Sync technology. The touchpad sits to the right of the keyboard and turns into a virtual number pad with a simple touch. The GX531 is a smaller 15.6-inch version of the GX701. Both will be available in the first quarter. Dell has four refreshed G Series laptops: 15.6-inch (7590) and 17.3-inch (7790) G7 models and two 15.6-inch G5 models, one of which is a Special Edition version (5590). All four offer the same GPUs, ranging from the GTX 1050 Ti to the RTX 2080 with Max-Q. They offer similar CPU options as well, though the two G7 laptops tack on a third eighth-generation Intel Core i9-8950HK six-core processor option. Most of what you’ll find across the board will be Full HD G-Sync displays at 60Hz or 144Hz refresh rates. You’ll also see a fourth display option on the 7590 and 5590 consisting of an OLED display with a 2160p resolution at 60Hz. Other ingredients include dual-storage options, support for up to 32GB of system memory at 2,666MHz, and more. The G5 15 SE ships in alpine white, and the other three sport an abyss grey finish. The G5 15 starts at $999, the G7 17 starts at $1,380, and the G7 15 starts at $1,099 on January 29. Thời gian xử lý trang này hết 0.119 giây.